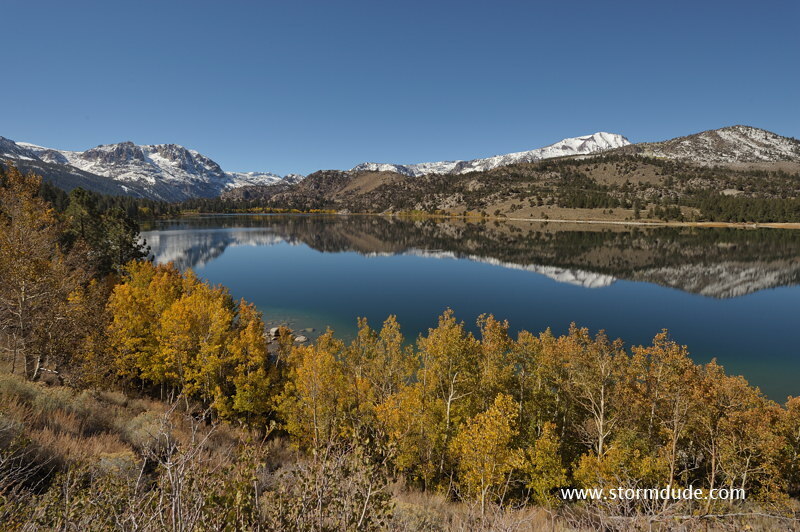 Arriving at June Lake as we begin a 10-day fall foliage tour of the central Sierra Nevada Mountains. 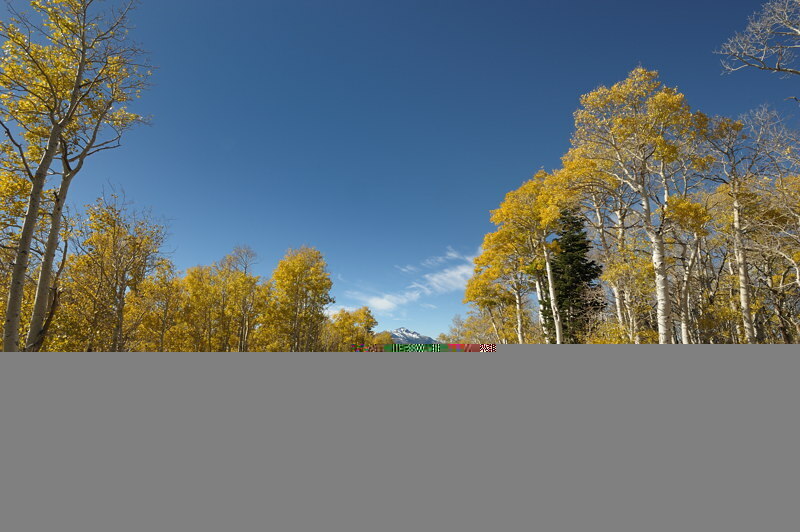 Aspens are at their peak color. Surrounding peaks are glazed with snow from an early October storm. 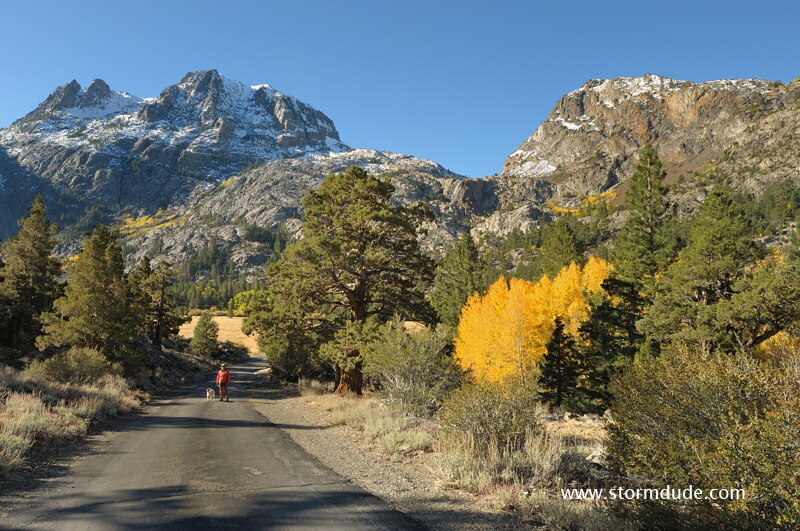 Exploring a small road near Silver Lake. 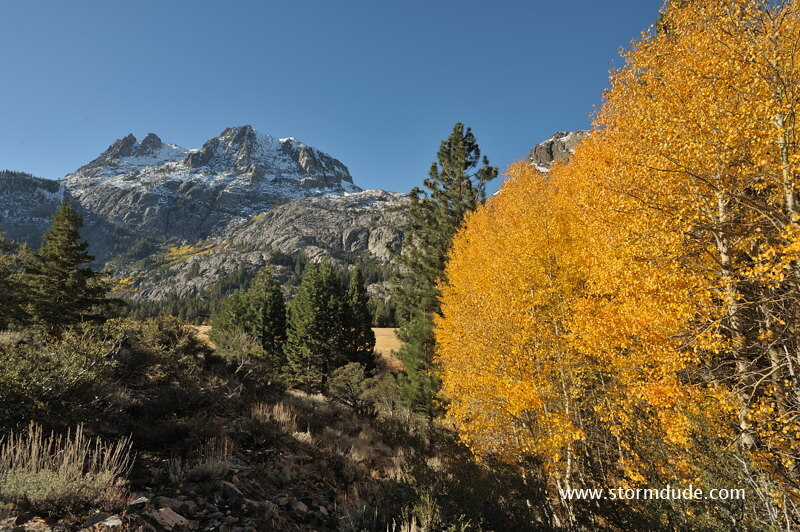 Fall color and rugged peaks offer a scenic combination. 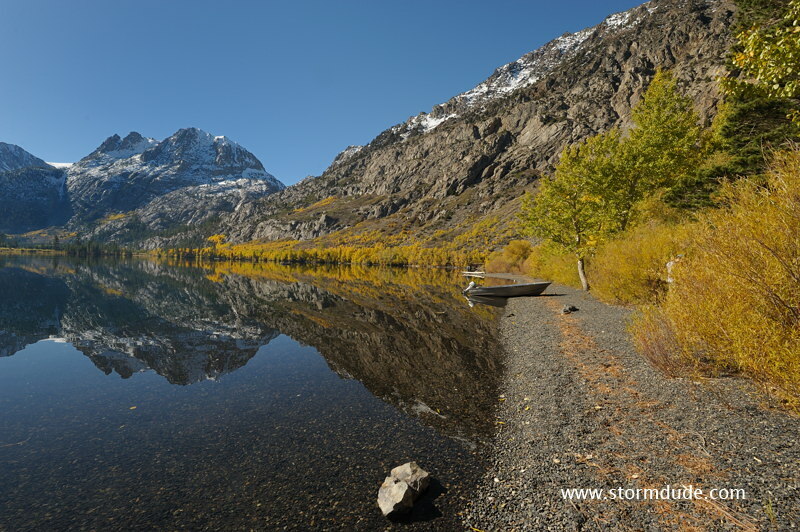 The north side of Silver Lake offers the most spectacular drive. 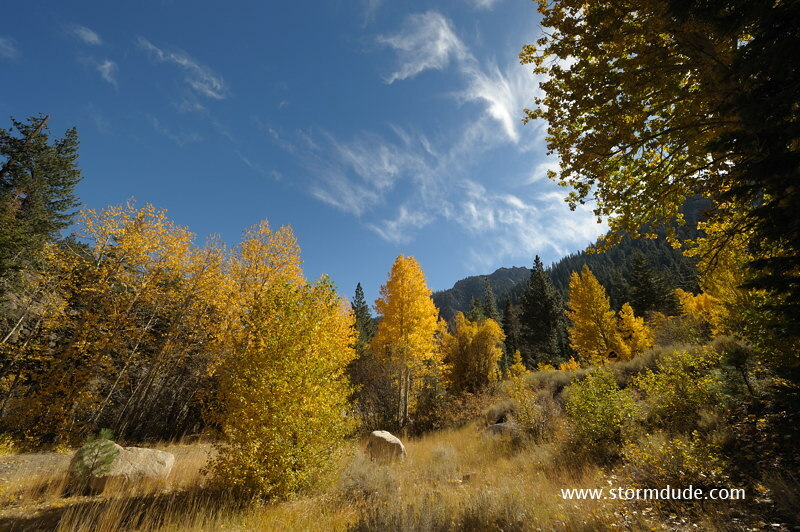 Shore of Silver Lake on a cool October morning. 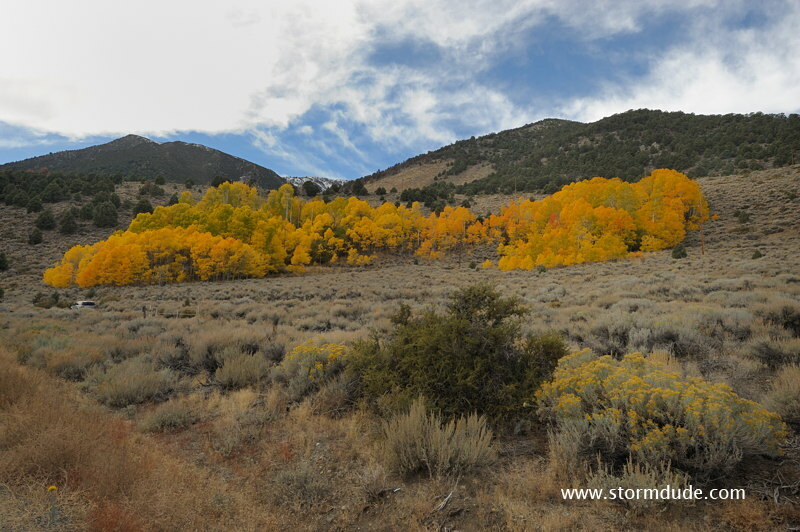 Quick side trip to a patch of aspens before beginning our day-hike to Parker Lake. 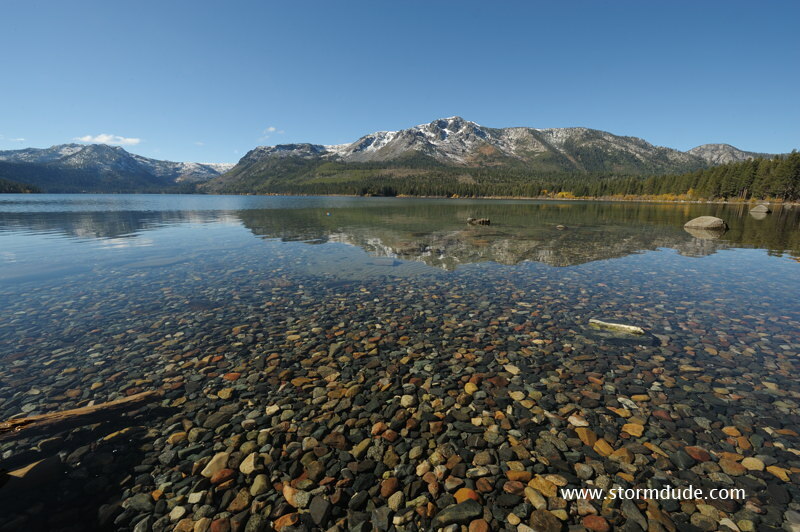 An easy two-mile hike brings us to Parker Lake. 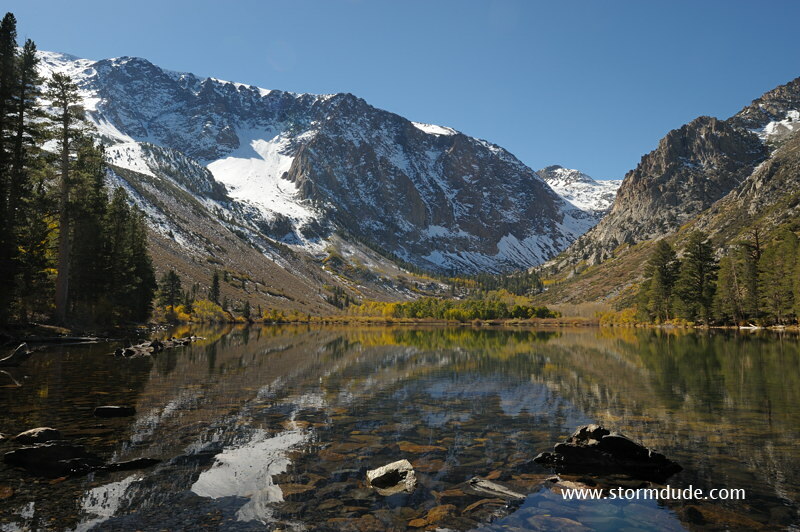 Fantastic view of June Lake as we leave the next morning. 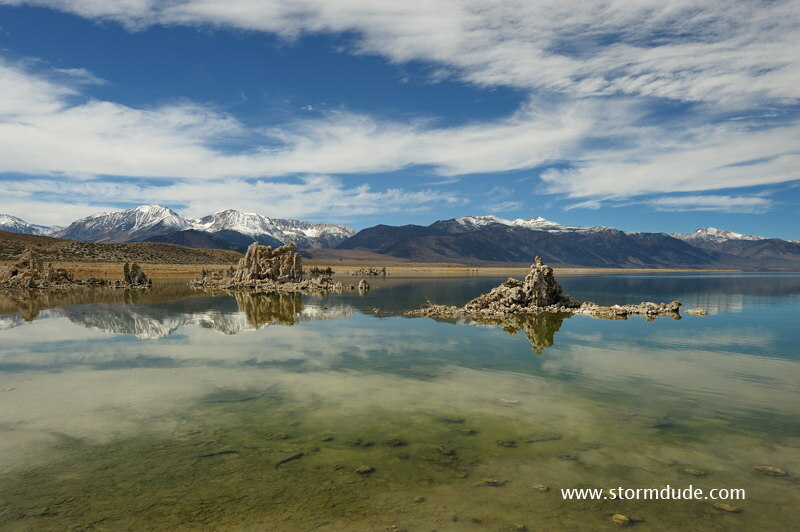 We continue our tour along the eastern side of the Sierras. 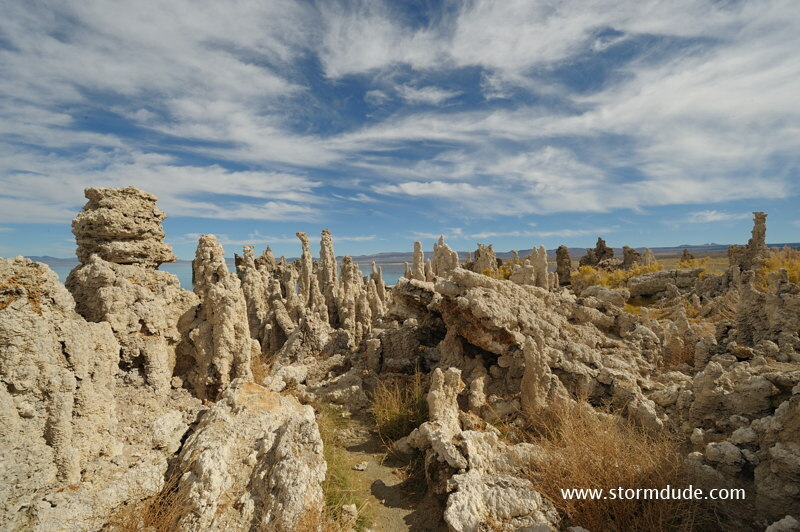 Walking among the tufa towers of Mono Lake (a few miles northeast of June Lake). 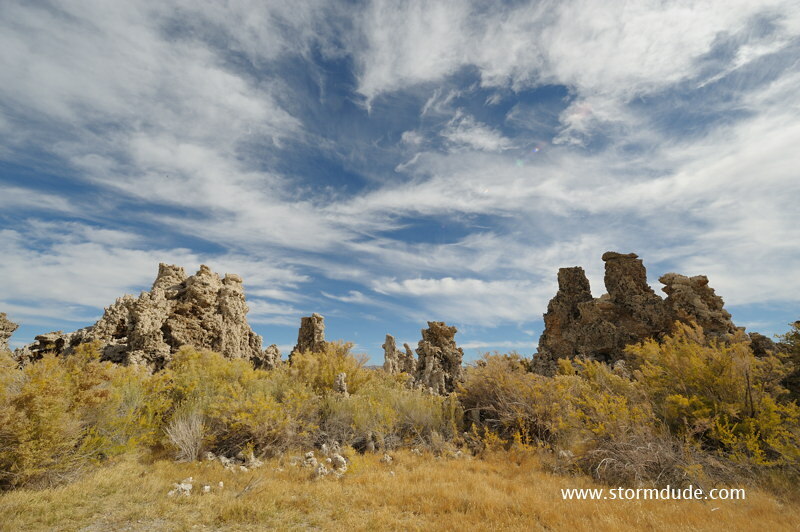 Eerie formations along the shoreline. 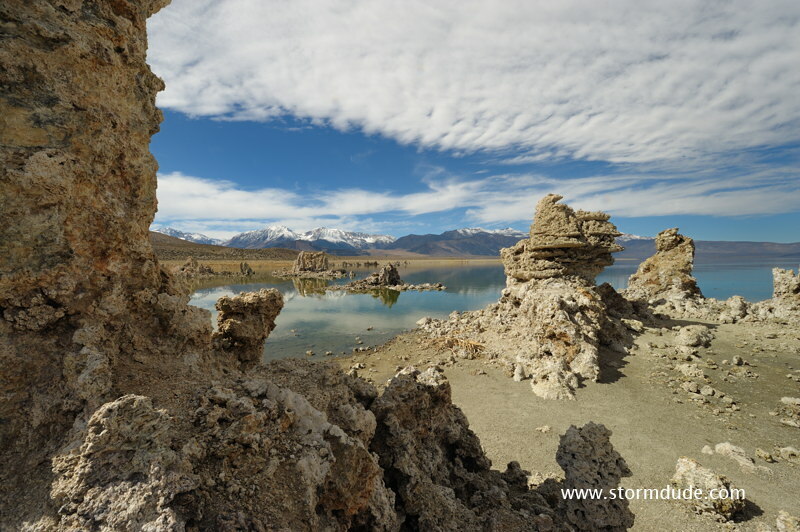 These limestone formations add to the mystique of the Sierras. Each view seems more amazing than the last. 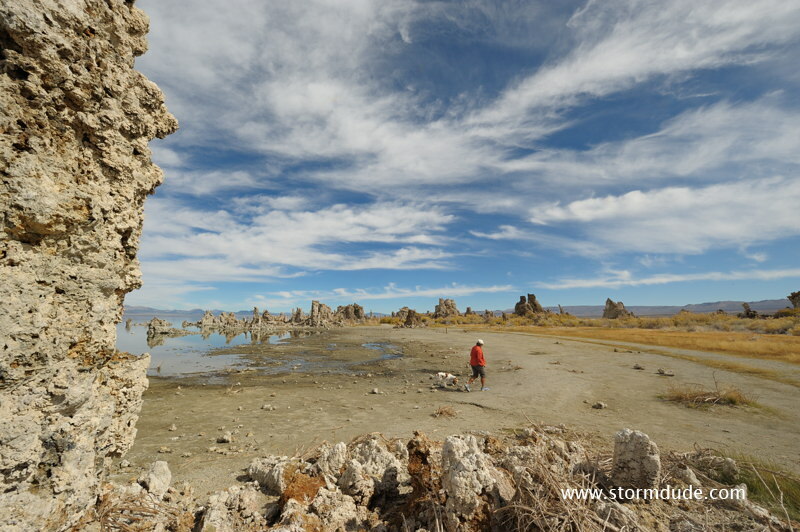 Mild temperatures make October the best time to visit Mono Lake, located at 6400-foot elevation. 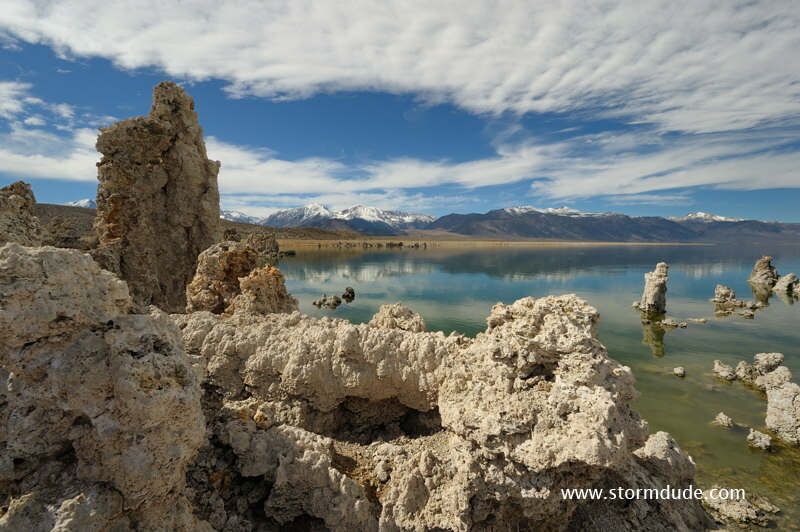 Eastern Sierra peaks as a backdrop to Mono Lake. 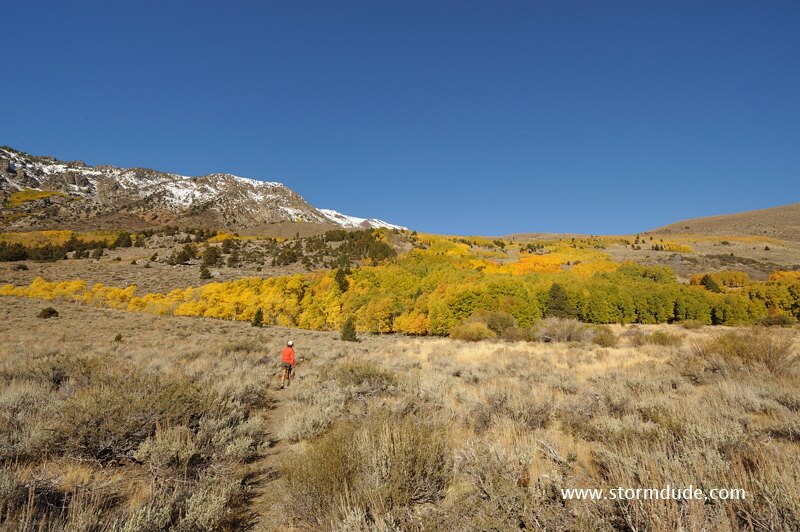 On the way to Bodie, we see more patches of aspen forest. 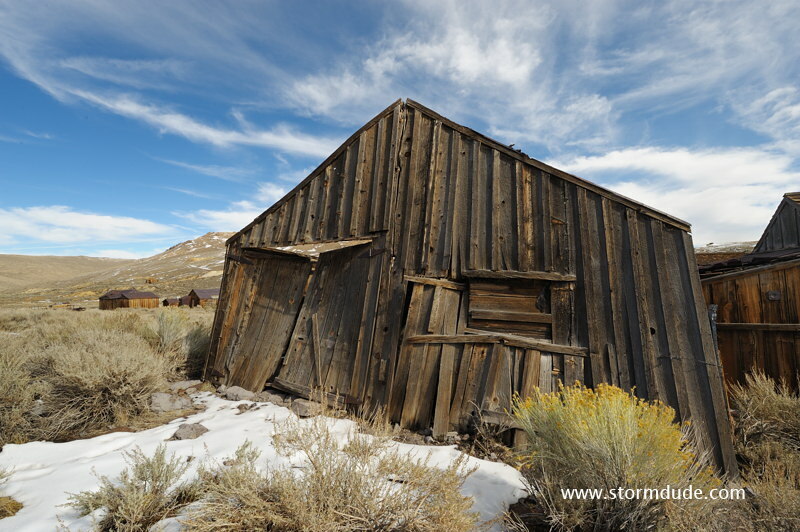 One of dozens of buildings remaining in the well-preserved ghost town of Bodie. 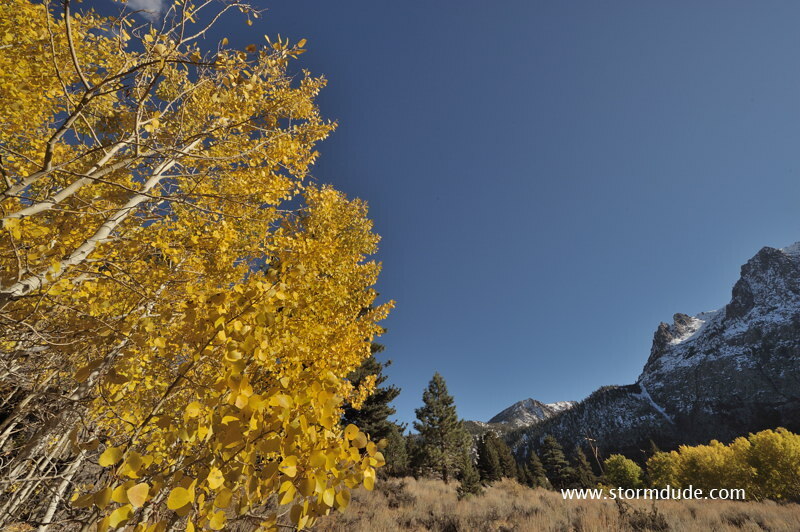 It's a pleasant October afternoon at 8400-foot elevation. 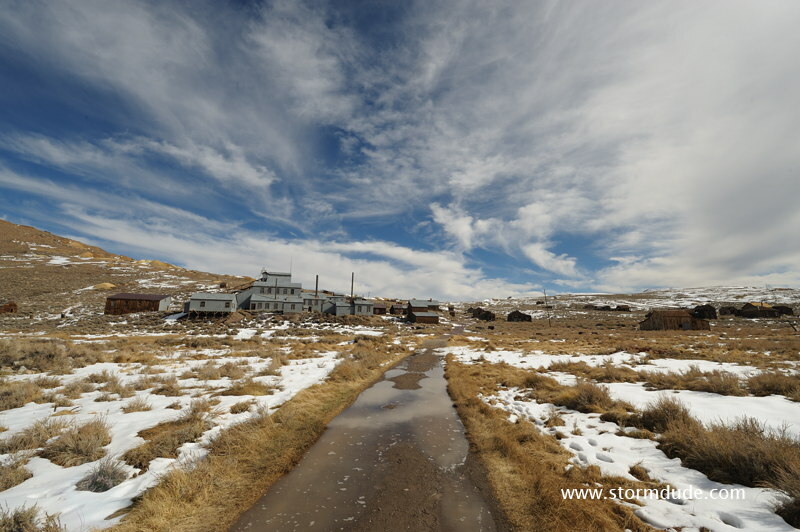 The site of over $30 million in gold production, mostly in the late 1800s. 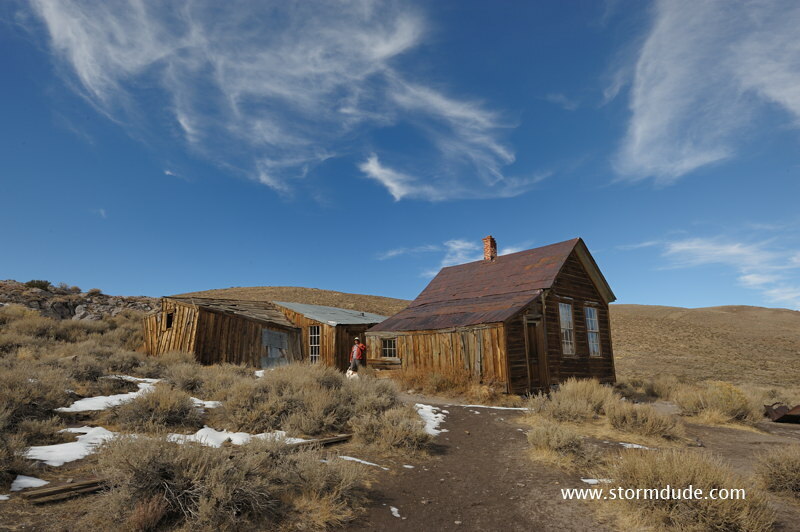 Bodie went from a population of around 10,000 in 1880 to a few dozen by the early 1920s. 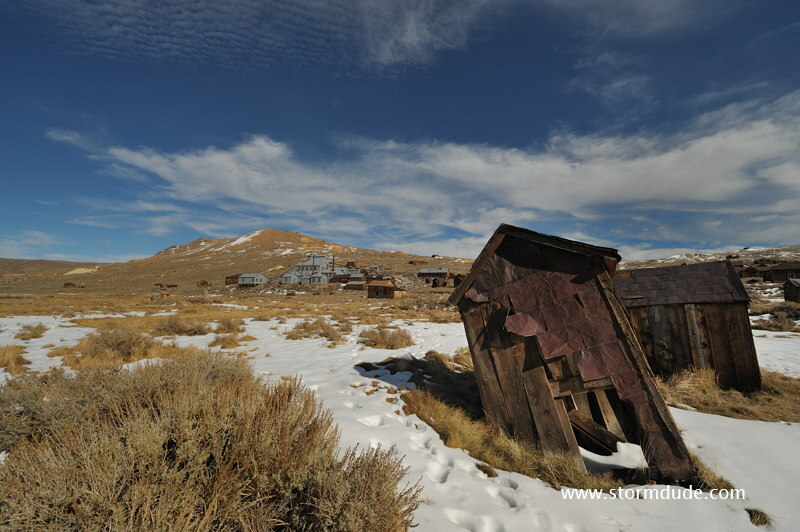 Crossing Monitor Pass, elevation 8314 feet, the next morning. 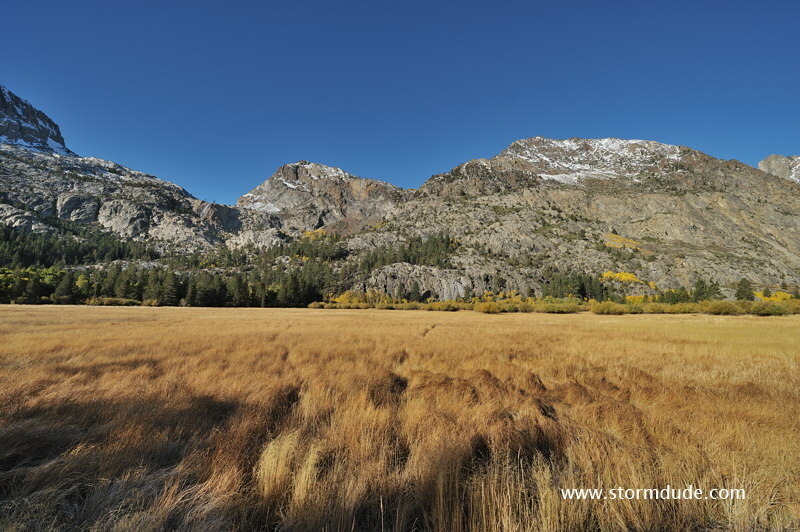 This is the mountain route to Lake Tahoe. 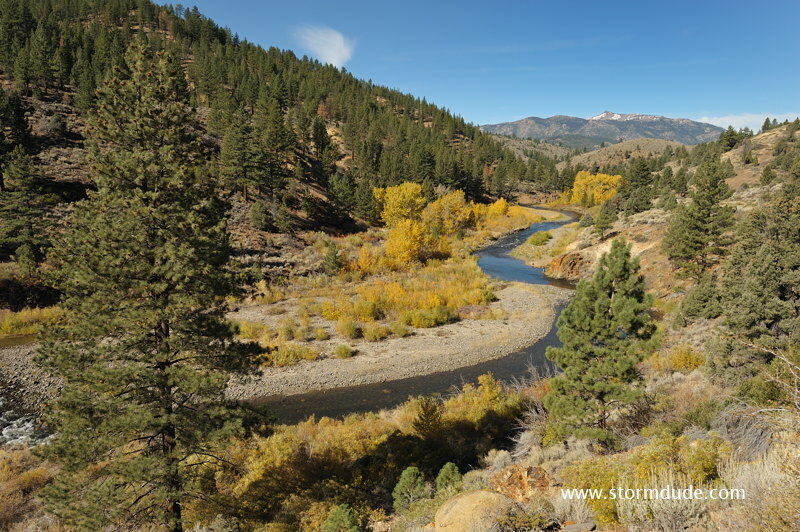 Carson River just south of Markleeville. 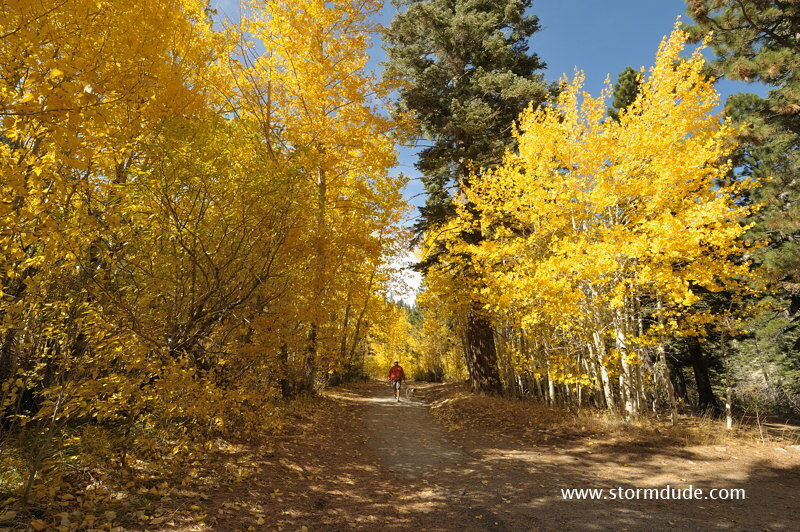 Along the Carson River is a steady feast of colors. 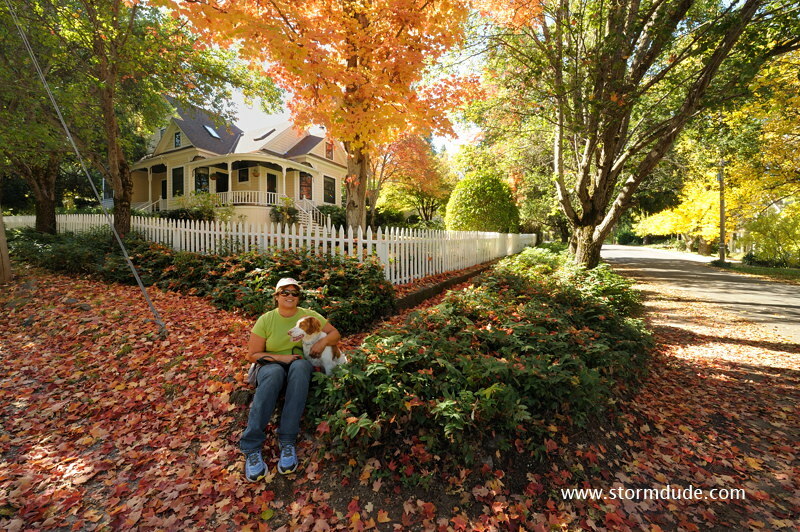 Walking the dog in the midst of surprisingly colorful California autumn scenery. 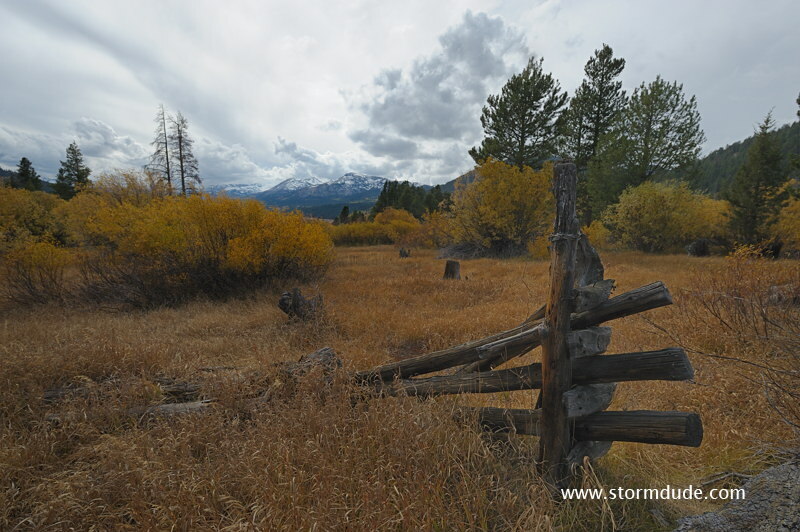 We drive into the next storm system about ten miles south of Lake Tahoe. It snowed the next morning. 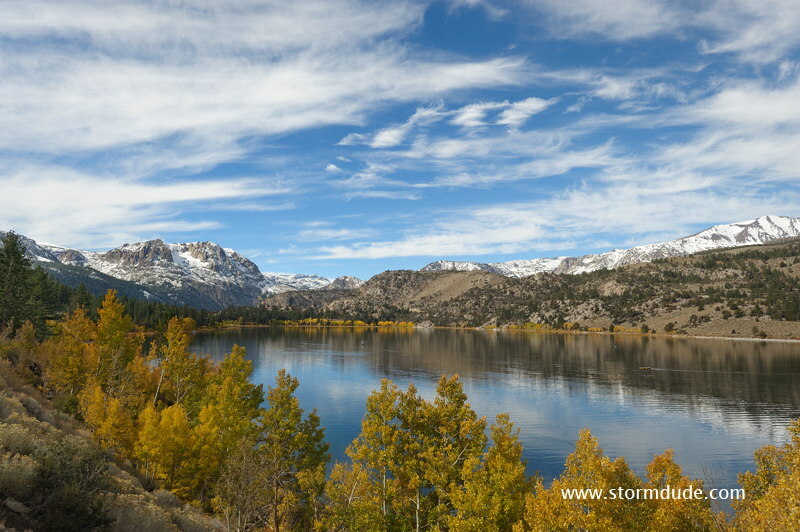 After waiting out the cold, stormy weather, we hike to Fallen Leaf Lake (near South Lake Tahoe). 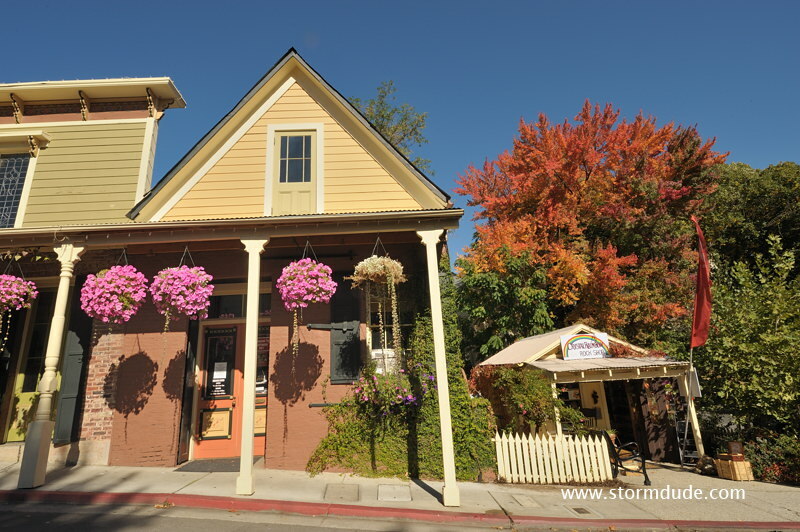 After taking Highway 49 across the Sierras, we arrive in Nevada City in California gold country. 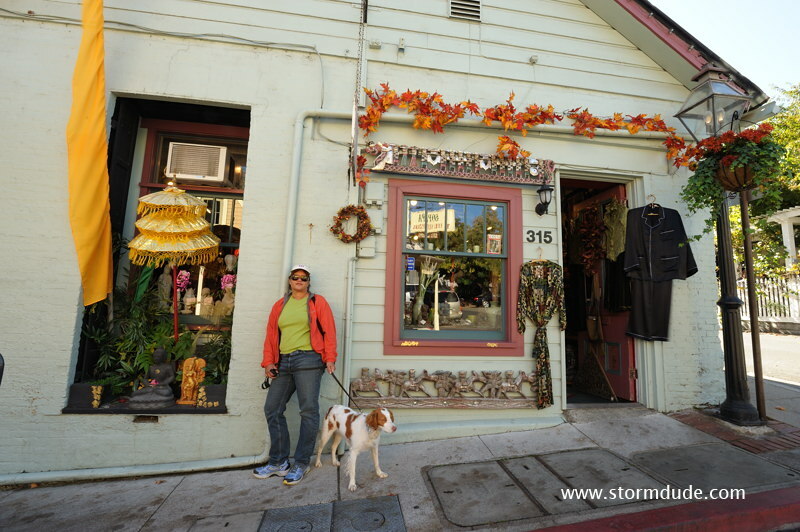 Enjoying our long stroll through this fantastic small historic town. 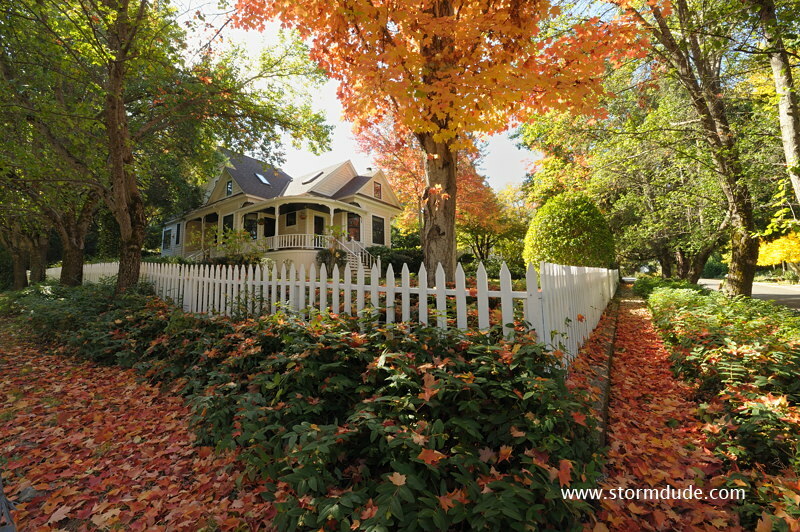 A taste of New England fall colors. 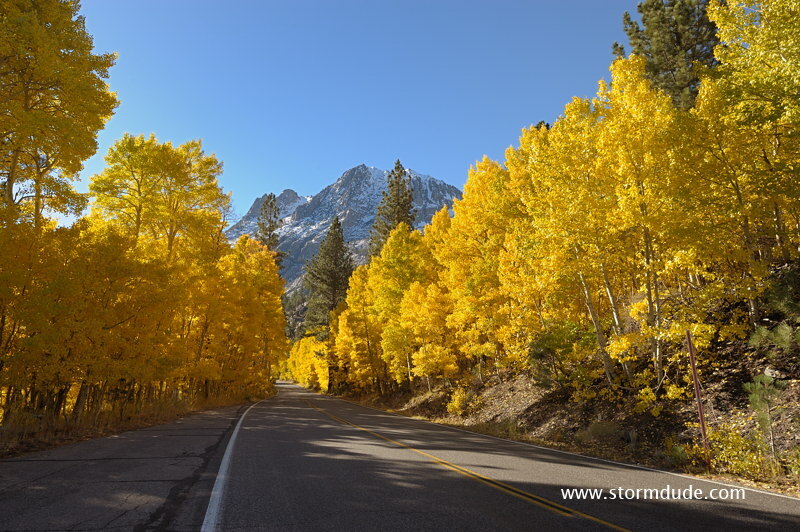 Although the scenery was enjoyable as we continued south along Highway 49, the highlights of the trip were the incredible colors of the eastern Sierras, Carson River valley, unique Mono Lake and quaint Nevada City.